Think letting customers post cranky reviews of your products will scare away sales? Here's the surprising truth. (Fortune Small Business) -- Like many retailers, Jim Hobart knows the value of a good testimonial. The online store he co-founded, AlpacaDirect.com, always offered a page full of cherry-picked customer comments raving about the site's alpaca sweaters, socks and yarn. But recently Hobart, 47, decided to take the idea a step further: He hired PowerReviews, whose software lets shoppers write their own product reviews directly on the retailer's Web site. It was a risky move for the four-year-old company, based in Brentwood, Calif. Hobart was effectively paying to host bad press -- such as posts by customers who described AlpacaDirect's golf cardigan as "kinda sweaty" and a "poor fit." Both awarded the cardigan three out of a possible five stars. "People are really researching their purchases," he says. "We knew our customers liked our products, and we wanted them to tell one another." 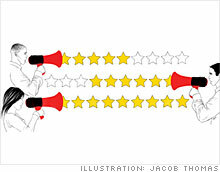 Online reviews have been spreading ever since Amazon.com (AMZN, Fortune 500) pioneered them in 1997. Witness the rise of "social shopping" Web sites like Kaboodle and ShopWiki and of consumer review sites, including Yelp and Judy's Book. But today's customer feedback software is growing more sophisticated, more personal and more affordable for small businesses. Consumers are becoming used to searching for reviews when they shop online. Internet shoppers rank reviews as the most desired feature of a Web site, according to a recent survey by Forrester Research. "People want to talk among themselves," says Jacqueline Anderson, a senior consultant at Forrester. Adds Larry Freed, CEO of ForeSee Results, which provides customer satisfaction surveys for Web sites: "If they leave your site to look for reviews, they most likely won't come back." Finding good review software isn't easy, as Hobart discovered. He was turned on to the idea in 2006 after offering 2,200 AlpacaDirect products via Amazon, where he noticed that products with customer reviews typically sold better. He investigated free review software but decided not to use the programs because they required extensive customization by an IT professional. Hobart was turned away when he first called San Francisco-based PowerReviews in 2007. At the time, PowerReviews focused on the enterprise market, customizing $1,000- to $2,000-a-month review software for larger retailers such as REI and Staples (SPLS, Fortune 500). But four months later the company called Hobart back, saying it had changed its mind. A stream of small businesses had been asking for inexpensive, easy-to-install software. "We now think this is a very big market," says PowerReviews vice president Darby Williams. Hobart currently pays $80 a month for PowerReviews Express. The software sends e-mails to customers who have made purchases and invites them to submit reviews. The feedback system includes a text box for comments and the all-important five-star rating system. PowerReviews' staff members read every review and remove posts they deem obscene or libelous. Otherwise, everything is fair game. It's important that site owners resist the temptation to edit or delete reviews they don't like. "If everything is positive, that raises a red flag among consumers," says Forrester's Anderson. According to market research firm Keller Fay Group, 87% of consumers tend to write reviews when they have positive things to say. And even negative reviews can be beneficial. When one customer grumbled that a photo of a yarn spool misrepresented its shade of green, Hobart responded by posting a new photo. He also appended a comment to the negative review saying that the problem had been dealt with. Ultimately, says Hobart, reviews retain customers. The vast majority of AlpacaDirect's customers return, so it's crucial to snag first-timers. "Reviews help build that initial trust," he says. "They are key to the long-term success of our company."